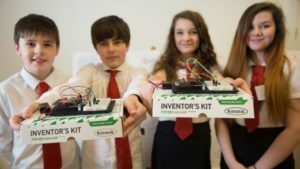 Incremental Group funding and project delivery support will provide young people aged 16 and under with opportunities to learn computer and digital skills, widening the provision of extracurricular digital activities across Scotland. Digital Xtra Fund is a Scottish Charitable Incorporated Organisation (SCIO) that forms a key strand of a nationwide drive to develop the digital talent of all young people across Scotland. The Fund provides grant awards to support organisations that help young people develop computer and digital making skills through high-quality extracurricular activities. Digital Xtra Fund was originally established in 2016 and funded through the Digital Scotland Business Excellence Partnership whose partners included Scottish Government, Skills Development Scotland, Scottish Enterprise, Highlands and Islands Enterprise, Scottish Funding Council, Education Scotland, ScotlandIS, and industry representatives. In March 2017, Digital Xtra Fund was spun out as an independent charity to enable it to work more closely with industry and address the digital skills gap. In November, the Fund awarded a total of £50,000 to 11 exciting and engaging initiatives across Scotland. Formula 1, 3D printed drones, lighthouses, and coding for social good were just some of the activities to receive support. The Fund is now working with organisations, including Incremental Group, who also understand the importance of teaching young people to understand and create with technology to develop the 2018 grant awards programme. Public resources in many parts of Scotland are being stretched, so a collaborative effort within the private sector is key to engaging more young people in digital technologies.